With an unmatched location, Grand Mercure Golden Jeddah is certain to delight travelers of all backgrounds. These vacation ownership opportunities in Saudi Arabia should not be passed up if you're looking for a destination that takes you beyond the ordinary. Jeddah, Saudi Arabia is a famous destination. As a port city on the Red Sea, Jeddah boasts gorgeous beaches and breathtaking vistas. The windsurfing here is world class, as is the diving. Also on tap are museums, historic houses and aquariums. Several theme parks are here, and no one will want to miss an opportunity to visit a traditional marketplace. Visitors are advised to set aside time to explore the Jeddah Corniche, a seafront walkway that is dotted by public art, spectacular fountains and more. Grand Mercure Golden Jeddah is situated in the midst of two commercial districts and boasts easy access to a private beach. This means that guests have everything they need within reach. Two on-site restaurants serve a wide variety of international cuisines to satisfy any guest's palate. Sailing and diving facilities are nearby, and guests can arrange windsurfing excursions at the front desk. The desk is available on a 24-hour basis, as is room service. Guests can make use of a variety of business services and conference rooms. Laundry service is available for an extra fee. Hotel-style rooms at this vacation ownership property are air conditioned and have a mini bar and safe. 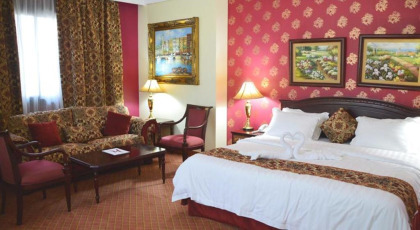 Satellite television and Wi-Fi connections are available in all rooms. In addition to basic hotel rooms, guests may choose between six Executive Suites and six Royal Suites, each of which boasts two bedrooms and a full kitchen. Most rooms have either two or three beds to suit the needs of any size party. With comfortable appointments and generous square footage, this resort is designed to delight both business and casual travelers. Grand Mercure Golden Jeddah affords elegant accommodations in a stunning setting that gives you access to all of the best in the city. Choose this Saudi Arabia vacation ownership opportunity if you want to enjoy one of the world's best vacation destinations. 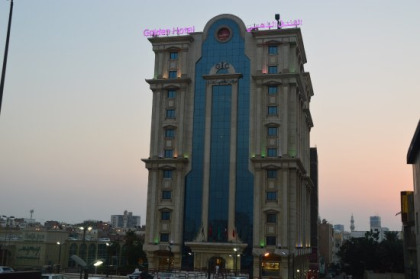 Contact Grand Mercure Golden Jeddah Specialist Today!